How do you prove there is a God apart from the Bible? Find out with guest Carl Gallups on the show Christ in Prophecy. Last aired on August 3, 2014. Dr. Reagan: Throughout my lifetime I have heard Christian leaders say over and over again that the existence of God cannot be proven. Instead, they have argued that a belief in God must be based on a leap of faith. Well our special guest this week, a renowned Christian author says that is not true. He argues that the existence of God can be proven. Stay tuned for a fascinating and enlightening interview with Pastor Carl Gallups. Dr. Reagan: Greetings in the name of Jesus, our Blessed Hope, and welcome to Christ in Prophecy. My colleague Nathan Jones and I have a very special guest with us today. He is Carl Gallups the author of a bestselling book called, The Magic Man in the Sky. Nathan Jones: Carl is the long time senior pastor of Hickory Hammock Baptist Church in Milton, Florida. That’s in the panhandle of Florida near Pensacola. Additionally he is a conference speaker, evangelist, and prominent radio talk show host. Dr. Reagan: And, as I said before he is the author of this bestselling book called, The Magic Man in the Sky. It is one of the best books that I have read in recent years and the moment I finished reading it, I called Carl and invited him to appear on this program. Nathan Jones: Last week we discussed with Carl the meaning of the competing biblical and secular worldviews. And if you missed that program you can find it on our website at lamblion.com. Pastor Gallups welcome back to Christ in Prophecy. Carl Gallups: Nathan, thank you so much for having me back. Nathan Jones: Good to have you here. Dr. Reagan: Carl one of the most interesting things in your book to me was when you began to discuss the existence of God. As I said at the beginning of the program you point out that most Christian leaders argue that there is no way you can prove the existence of God. Dr. Reagan: That you just got to take a great leap of faith and accept Him by faith. Explain your position. Dr. Reagan: You got their attention. Now the reason is, Dave, as you said there is, for someone to say, “Well you can’t prove the existence of God.” Wait a minute think about that logically. If there is a God, and I believe there is. If He is the omnipotent, omniscient, omnipresent, creator of the universe. And of course I believe He is. If He is the God of the Bible, and if the Bible is God’s Word and I believe all of that. Then doesn’t it make sense that that God could prove Himself? Would prove Himself? Has proven Himself? Why would a God that awesome leave Himself to where you can’t prove His existence? Well as a matter of fact not only has God done that, but He declares in His Word that He would do it. And He said He would do it in such a way that it would be irrefutable, indisputable. And He says that I am going to give you some little hints in Deuteronomy 4 He says, “And I have done this thing so that you will know that I am God and beside me there is none other.” Now that is one of the first places makes that declaration. Carl Gallups: But throughout the Bible that declaration is made. In the book of Isaiah there are several huge declarations. Ezekiel that same declaration is made. So what is this thing that God says? He said, “I will do.” Listen to what He said, He said, “So that you will know that I am God, and beside me there is none other.” So what He’s saying is when I accomplish this work then you will know. I will have proven myself. And its indisputable. It is irrefutable. Now I paraphrase but that’s what He says. And again that same declaration that God makes is found in Isaiah and Ezekiel. And so now we look at history. People say, “Yeah, but you are trying to prove God from the Bible that is circular reasoning.” No, no, no, because these words were proclaimed 1,000’s of years before the event happened. So what do we know? Now forget the Bible what does history tell us? Forget the Bible let’s hold onto the Bible because that’s where God says, “Here is how I am going to prove that I am God. And that this is My Word and My only Word. And I’m the only God.” Now lay the Bible aside now let’s just think, what happened? Well people came out of Egypt. They settled the land. They became the nation of Israel. Who in the world doesn’t know about King David? King Solomon? King Saul? Of course the great and mighty nation of Israel. Who doesn’t know about the Civil War in Israel in the Northern Kingdom and the Southern Kingdom? Who doesn’t know about the Assyrian Empire conquering the Northern Kingdom and taking them into captivity? Babylon, Babylonian Empire taking the Southern Kingdom. Daniel, Shadrach, Meshach, Abednego. Who doesn’t know about the Persian Empire that swallows all of that up? The Greek Empire? This is world history. There is no more Israel. And then the Roman Empire there is no more Israel. But yet the prophecies continue down through the ages in the last days. The Valley of the Dry Bones, you know and Ezekiel looks at God and he says, “Who are these?” And God says, “You know. These are my people. This is a whole house of Israel that I will bring back in the last days.” What? There was no Israel when those words were spoken. So what do we know history says? History says all of this happened. They were dispersed into the uttermost parts of the earth but in 1948 in one day, in the book of Isaiah there is a prophecy where God says, “Who has ever heard of this? Shall a nation be born in one day? Carl Gallups: Who can do that but God?” In one day the nation of Israel came back to their land, to their strength, to their glory. The language if you will had been there, but I mean it was restored to a national language. The borders are there, the strength is there, the glory is there, the power is there. They are surrounded by enemies all of them conspiring and plotting to destroy them. They have been attacked six or seven times in major wars, six or seven major wars, never been defeated. All of it was foretold. God said when you see this happen what other God has ever done such a thing? Then you will know. Dr. Reagan: All I can say is when you said Israel and I read that in your book I was up dancing and shouting and all. Carl Gallups: Because you know. Dr. Reagan: I’ve spent my whole life talking about Israel. Carl Gallups: Right, right, it’s God’s proof. Dr. Reagan: And the bottom line is that everything that happened of a major nature to the nation of Israel in history was foretold. Carl Gallups: Hundreds of years prior. Dr. Reagan: You will be dispersed among the people of the world. You will be persecuted everywhere you go. Dr. Reagan: You will be preserved, what a miracle that is. You will be regathered. You will be re-established. All the world will come against you. And that’s where we are and it was all prophesized in advance. What further proof would you have to have that this is the Word of God and that God exists? Carl Gallups: That’s right. Hundreds of years before it happened and in some cases 2,000 years before it happened the prophecies were given. And we are the only generation in the history of the world, historical generation to have seen it happen. Dr. Reagan: What a time to live. Carl Gallups: We are living in the midst of God’s proof to the world, we are without excuse there is no God, but God, and this is His Word. Carl Gallups: There you go. Dr. Reagan: What do you think about that? Carl Gallups: Well it is turning their own as you brilliantly stated their own logic against them. And of course the humor of it is we know the atheist does exist, so yeah. Carl Gallups: So that is wonderful I love it, I love it. In fact I need to put that on my church. Nathan Jones: Well one of the evidences you used here for God existing is called the anthropic principle. Can you explain about that because I found that fascinating. Carl Gallups: Thank you. Thank you. Well the anthropic principle it comes from anthropology meaning having to do with man, the study of man and man’s origins, etc. But the anthropic principle in my book I come at it from a two pronged approach. The first prong is what most people know as the anthropic principle; that is when you look at the world, the world in which we live. In fact the world in which all 2 million to 20 million depending upon who is counting species the only life that we know in the universe so far is all on one ball floating in space. Earth that is it. And so you look at life on Earth and you think what does it take for that life to exist and to sustain itself? I mean if we were just a little further away from the sun, or a little closer to the sun. If the moon were a little further, or a little closer. If you took all the salt water of the earth away, well the ecology would die. If you left the salt water and took all the freshwater off the earth the ecology would die. If you left all that, took all the plants away, no plants, never again a green plant. Well we know that produces our oxygen and carbon dioxide, you’ve got to have it. The earth would die. If you took away all the insects of the world the earth would die. If you took away all the bees for example the earth is going to die, eventually. It would take a long time but you couldn’t have cross pollination then all the plants would die. Eventually everything would die. So you go through all of these different, what are called anthropic constants, things that have to be in order for life to be on earth. You go right down you say well take away all of the animals, take all the animals, all the animals, well eventually the earth would die because of the ecology. But watch this: take away man, leave everything else. What happens to the earth? It is fine. The earth goes on. Everything is fine. Oh, so it appears then logically speaking that with all of these factors these 100’s of factors that must be in place for life to go on, you remove any one of them basically and eventually everything winds down. But the one thing that you can remove and everything is fine is mankind. So it’s as if man was not made for the earth, but the earth was made for man. And so the anthropic principle says it appears as though this whole thing was designed for the purpose of sustaining mankind. Now that’s one prong. The other prong is look at mankind, evolutionists are fond of saying that we are so similar since we evolved from a common ancestor from a chimp that we are so similar to other animals. We are not much more than a souped-up gorilla. Carl Gallups: Yeah, well that is what they say, no God, no intelligent designer. And I say to that, “Really? Let’s take a look at that.” In fact there is a whole chapter in my book about this. I say, “Let’s take a look at this. Let’s take a look at man.” When you really examine this man is a universe apart from the next most intelligent creatures on the face of the earth. I mean dolphins, and whales, and chimps are fascinating creatures and they are pretty intelligent. But the smartest chimp in the world doesn’t hold a candle to a two year old human. Not only in their intelligence but also in the world changing capabilities that two year old can have as it matures and grows. Carl Gallups: A chimp swings in a tree, eats bananas and slings poop. And that is all they do, that’s all they’ve ever done. Nathan Jones: Well that is a huge evidence for people trying to grow in their faith and dispute the atheists. Is there other evidences that people can know God apart from the Bible then? Carl Gallups: Yeah. You mean are there are ways that people can come to know God if they don’t ever have a Bible? Nathan Jones: Yeah, they never had a Bible. They are in some rainforest somewhere and they’ve got to come to know God. Is there a possible way? Carl Gallups: Yes, as a matter of fact and I’ve got a chapter entitled something the lines of, But What About Those Who Have Never Heard? Nathan Jones: Yeah, huge question and people are always asking. Carl Gallups: So in other words what happens to the person living in the Amazon that a preacher never comes and opens a Bible and reads the Gospel to them? And wonderful question and that question is based upon a couple of false premises. First of all it is based upon the premise that well all men are innocent from the beginning and therefore if they don’t hear the Gospel and they are sent to Hell somehow that is unfair. But we know the Word of God says that we are all born in sin in the first place. Carl Gallups: So but to get to the point of your question, Are their ways that someone can come to an understanding of God apart from the Bible? Well we know that the preaching of the Gospel is Gods main purpose, His main way, His main design for men and women, boys and girls to know Him. However, we also know from that Word what Romans 1 says that we are without excuse. The man in the Amazon jungle is without excuse by the things that have been created, by the things that are made we know that there is a God and we’re not Him. Nathan Jones: General revelation it is called, right? Carl Gallups: General revelation, so we know that just to begin with. But we also know I think about Moses in the backside of the desert I mean God put a bush on fire for him and said, “Come here Moses I want to talk to you.” “Who are you?” “I am the Lord.” Ok. The Apostle Paul he was on his way to kill Christians in the name of God, outside the Temple of God thinking they had done God a favor they crucified the Son of God. Paul was a Pharisee, just a few years later he was helping to stone Christians. He was on his way to kill more Christians how’s anyone going to reach him? Well the Lord Jesus appeared to him. Struck him blind, struck him down on the road became one of you know the greatest evangelist and missionary of all time. Nathan Jones: That is special revelation, the opposite. Carl Gallups: So that’s my quick answer to it. Nathan Jones: Welcome back to Christ in Prophecy and our discussion with Carl Gallups the author of this very insightful book The Magic Man in the Sky. Carl Gallups: Right, right. Well you know that’s kind the question of the ages I suppose. But here’s what I say to the atheist, Okay, so you’re going to say, you are going to use that as an attack against the God of the Bible. It’s only fair then that we go to the Word and see what God says about that. And the general message from the Word of God about that question is this, I mean Job can tell us about that. But the general answer to that is this, look the basis for evil in the world is man’s rebellion against God, okay. Whenever you take away the light of God or the truth of God, comes in the darkness of evil. And so the basis of evil is found there. Carl Gallups: And so evil kind of becomes used in this whole process. But the bottom line is evil is here because of man’s rebellion against God. But God is going to fix it, He’s going take care of it all in the end. Carl Gallups: That’s right. That’s right. Praise God He hasn’t. Dr. Reagan: He has provided another way. Dr. Reagan: Well He was there, but we’ve kicked Him out of our schools. Nathan Jones: Amen. Well what about evolutionists who say that evolution is proven, it is scientific fact? There is no disputing it because it has already been proven. How do you respond? Carl Gallups: Yeah, here’s how I respond. No matter how loudly the ardent, fulminating, evolutionist screams that evolution is a settled science. It is not. I have several chapters in my book that proves that I believe irrefutably. But for the purpose of this audience and this limited time the bottom line to that argument is this: evolution is, think of this guys, evolution is man’s best answer to how we got here if you leave God out of the picture. It’s the best in 10,000 years of human history it the best that man has been able to come up with. I mean think about that, now I want you to keep that in mind because when I start tearing it apart you will see how horrible that is. But that’s man’s best answer and they’ve couched it and wrapped it in this shell of a lie that says, and it is settled scientific fact, you see. Carl Gallups: So alright what I say to that is, “Really, it is settled science?” I say this, it is fascinating speculation because let’s face it if there is no God, and of course I know there is, but if there’s not then we had to get here somehow because here we are. So evolution is fascinating speculation. Let’s speculate, could it be that out of a magical sludge pond, with a magically bolt of lightning, magical billions of years ago magically the first living thing came from nothing. Dr. Reagan: Well that takes a lot of faith. Carl Gallups: Yeah, well I know. And so I am saying that is interesting speculation but that’s not settled science. And as a matter of fact I give many illustrations of how it’s not settled science fundamentally foundationally how the evolution proposition is flawed. Nathan Jones: What’s an example I would be curious? Carl Gallups: Well the best example I think is the example of going all the way back to the origins and I kind of touched on it. I give quote after quote in my book and I give the references of modern day well respected scientist of evolution, people who have written books, people who have written textbook who will say something like this, and I’m melding it all together, “Abiogenesis is the best scientific answer for how we got here.” Now I’ve got them quoted. Nathan Jones: Spontaneous generation, right? Carl Gallups: Well I was going to say as you know and your audience knows that’s just a fancy souped-up word for spontaneous generation. Nathan Jones: It is a medieval thought, right. Carl Gallups: It is superstition. Aristotle brought it 2,000 years ago. And about 200 years through works of Louis Pasteur, and he was building on the works of others. They proved that it is absolutely not only it scientifically impossible for life to arise from non-life accidentally or otherwise. I mean even with intelligent input of scientist we’ve not been able to do that. But not only is it impossible but it is pure superstition. But that is the basis for origins/evolution proposition today. So the foundation is flawed from the beginning. To say that the way it all started was non-living material and I’m going to use this word because they won’t, and I play it up here, and magically became living material without any intelligent input. Because you see the evolutionist will say, “Well your Bible says that God brought life from the dust of the earth.” Yes, but that was with intelligent, supernatural, input. Dr. Reagan: So what you are saying is that the people who truly believe in magic are those who have the scientific view? Carl Gallups: scientific, those that say that evolution is settled science there the ones that believe in magic. In fact they’re clinging to nothing more than ancient superstition. 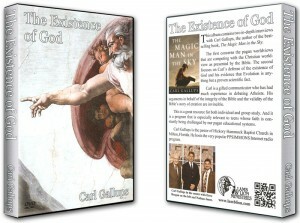 Dr. Reagan: Welcome back to our discussion with Carl Gallups the author of the great book, The Magic Man in the Sky. Nathan Jones: What’s the ultimate question? Carl Gallups: Well thank you. Well the book to me would not have been worth writing if it didn’t end with this presentation. The ultimate question can be stated in many ways, but something like: If you were to die today where would you spend eternity? And there are other ways to state that. That is the ultimate question. That’s the ultimate question of life because we know that this life is limited, 60, 70, 80, 90 years if were blessed. And then what? Well the Word of God tells us what. And of course my book is written to prove that is the Word of God, that there is a God, He is the Creator. And that there is something beyond this fish pond. So the ultimate question is: when you leave this fish pond where are you going from there? And of course we know of course through the Word of God that eternal life is offered only through a born-again relationship in Jesus Christ. Dr. Reagan: Why don’t you speak right into this camera Carl and tell people watching what they need to do in order to part of the family of God. Carl Gallups: Thank you. What you need to do to be part of the family of God. Romans 10:9 says it succinctly, “If you would confess with your mouth that Jesus Christ is Lord, believe in your heart that God raised Him from the dead. You shall be saved.” And then Romans 10:13 says, “And for whosoever shall call upon the name of the Lord shall be saved.” So the Gospel message is very clear, very succinct, and very plain. You must understand there is a God and He is God. And that He created you on purpose with a purpose. You’re not a souped-up gorilla. You didn’t get here accidently. There is purpose, meaning, worth and dignity for your life. And that you can spend eternity with Him. But because we have a sin nature that there must be a provision for our salvation. But God made that provision in Jesus Christ and that if you’d repent of your sin, call upon Jesus as Lord asking Him to save you, God says in His Word again Romans 10:13, “For whosoever will call upon the name of the Lord shall be saved.” Confess with your mouth believe in your heart and God will save you. Dr. Reagan: Well Carl we really appreciate you being on our program you have been a great blessing. Carl Gallups: It’s been my honor. Dr. Reagan: I’d like for you to look in that camera again and tell people how they can get in touch with your radio program, okay. Carl Gallups: Yeah, the best way to find out everything about me, the book, the radio program, the church that I pastor my ministry, our internet ministries, the PPSIMMONS ministry all the videos we’ve done. It is very simple go to carlgallups.com, carlgallups.com. You’ll find everything there. We’ve got a listen live link when I’m on the radio. Podcasts, you can download all of our programs, 100’s and 100’s of videos, it’s all right there at carlgallups.com. Dr. Reagan: And Nathan how about you telling the people how they can get in touch with you and send the most difficult questions they’ve ever thought of in their life. Nathan Jones: That would be carlgallups.com. Carl Gallups: That’s right carlgallups.com. Nathan Jones: You can go to lamblion.com, and just go to the contact page. You can also contact us through our blog at lamblion.us, and our Facebook group.